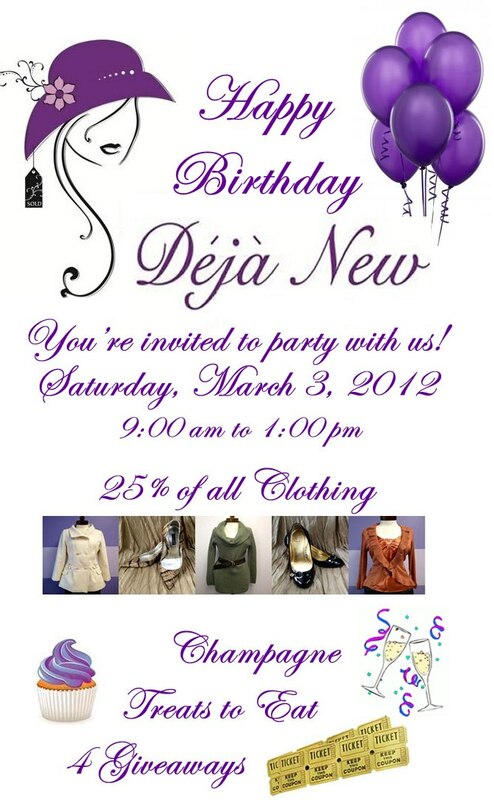 Come Celebrate Deja New’s First Birthday!! ≈ Comments Off on Come Celebrate Deja New’s First Birthday!! As you may recall, I have been volunteering with Women Helping Women & Men 2 Work doing image styling and personal shopping to empower low income individuals to attain self-sufficiency through employment success. Their retail boutique is called Deja New where they sell quality clothing from their donations including some awesome designer finds at a fraction of the price! This boutique along with the generous donations of their supporters, helps to fund to overall operations of the non-profit organization. So if you are available between the hours of 9am-1pm on Saturday March 3rd then come on down and see all the goodies they have available! I will be there helping them celebrate their one year anniversary as well as providing free style advice and an excellent personal shopping experience! Click Here to See Photos Of Deja New! More photos on Deja New’s Facebook page here.